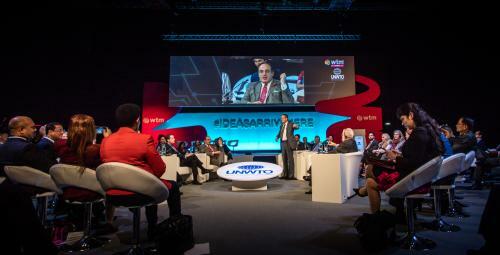 Madrid, Spain, 2018-Nov-09 — /Travel PR News/ — The UNWTO/WTM Ministers’ Summit, held yesterday by World Travel Market and the World Tourism Organization (UNWTO), was well received by participants from government and the private sector for its more dynamic new format leading to more concrete takeaways around this year’s theme: Investment in Tourism Technology. This entry was posted in Business, Festivals and Events, Tourism, Travel, Travel Tech, Travelers and tagged Bahrain, Benjamin Liberoff, Bulgaria, Egypt, investment, Italy, Jaime Cabal, Lio Chen, Malaysia, Mexico, Michael Ellis, Ministers, Portugal, Romania, Simon Press, South Africa, summit, Technology, tourism, Uganda, UK, UNWTO, Uruguay, WTM. Bookmark the permalink.